The official start of winter is almost here and the cold weather has made an appearance or two. I can’t think of a better time to write a post about how to pick a small portable electric heater to help you keep warm on those chilly nights in Valley Springs. For the purposes of this post we will only be talking about electric heaters, and not natural gas, propane, kerosene, or wood burning ones; we’ll save those for another day. Ideally you would want to use propane or natural gas because it may cost up to 50% less than using electric heating. But portable electric heaters do have their place, too. The first thing you need to figure out is what your goals are. Are you looking for something small that is easily hidden when the cold times of the season are over, or is something a tad bigger ok? How loud of a fan can you tolerate? Some portable heaters have fans that can be quite noisy, while others are completely silent. Do you need special options like a sleep timer in case you fall asleep with it on or a remote control so you can turn it off in bed? FACT: Space heaters cause an estimated 21,650 home fires and 1,512 fire-related injuries and deaths each year, according the National Fire Protection Association (NFPA). What other heating features do you want? 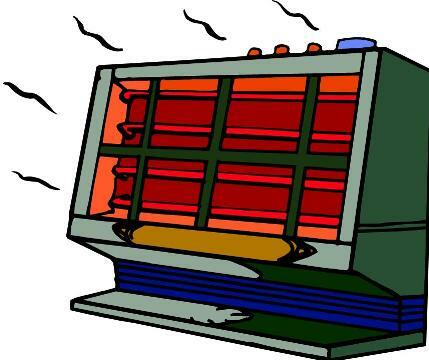 There are a huge amount of heaters on the market with a vast array of heating elements. For example some look like furniture, while others are meant to look like fireplaces with burning logs. I hate to let the cat out of the bag, but all electric heaters are 100% efficient, so it really doesn’t matter if you spend $1,000 for one of those redwood quartz type things or $15.00 for a basic heater with a fan on it. If the heater is 1500 watts (as most are) it’s going to put out the same amount of energy. So besides how pretty some of those really expensive heaters look, it’s my opinion they are just a waste of money; at least from a heating perspective. Some sure are quite a work of art, though. Once you’ve decided on your heating goals, you’ll need to size the portable electric heater to your room. Most heaters typically have information on how many BTUs they put out, as well as give you a general room size that they can handle. A few general guidelines can be used to simplify heater sizing for enclosed spaces indoors. I say ‘general’ because they aren’t 100% perfect. For example if it’s 80 degrees below zero outside, you may have a problem receiving enough heat, or if your house has no insulation and a lot of air leaks, you’re going to wish you got a bigger heater. Keep in mind that a 1,500 watt heater can typically heat a room up to 150 square feet in size. Here are a couple of sizing calculations to use. To make a rough calculation, multiply the total cubic feet of space to be heated by a factor of five to determine the minimum heat output needed (5,000 cubic feet X 5 = 25,000 BTUs). On most heaters the BTU rating is stamped on the package. Here’s another example to make it clear; Your room is 12 feet wide by 12 feet long by 12 feet high. To get the cubic feet we multiply the numbers above, 12 x 12 x 12, and get 1728 cubic feet. Then we multiply 1728 by 5 to get 8,640 – the BTUs needed to heat up the 12’ x 12’ 12’ room effectively. There are 3.4 BTUs in a watt so we would need a 2,541 watt heater (8,640 BTUs divided by 3.4 BTUs in a watt = 2,541 watts). Another method is to provide 10 kilowatts (10,000 watts) of heat output for each 1,000 square feet of floor space (10 watts per square foot. ); because 10 kW equals approximately 34,000 BTUs, or 3.4 BTUs per watt, you can do the math to choose a unit rated in BTUs. For a 150 square foot room you would need a 1,500 watt heater; 10 watts per square foot times 150 square feet = 1,500 watts. Safely features are just as important to consider when choosing a portable electric heater as size and strength. If the heater is knocked over will it turn off? Ff you have small kids or animals around will it be hot to the touch? Does it have overheating protection? Remember to always put the heater on a hard level surface if possible, and keep drapes and other combustible materials away form the heater. Most heater manufactures recommend at least 3 feet of clearance space in all directions of the portable heater. Don’t use the heater in the bathroom unless it’s specifically approved for such use. Don’t use an extension cord unless absolutely necessary. If you do, make sure it has a heavy l2 – 14 gauge wire. The heater should generally be the only thing plugged into the outlet, and if possible, on the entire circuit. Most residential homes have 15 amp circuit breakers, which will handle 1,800 watts maximum safely. It’s a good idea to keep a 10% cushion, so a max of closer to 1,600 watts is probably best. Most of the portable heaters made are rated at about 1,500 watts on the high setting so you really don’t have much room before you pop your circuit breaker or fuse. These heaters can sometimes be difficult to use in bedrooms because homes are typically wired to only have one circuit breaker feeding your entire bedroom. You have your lights, alarm clock, cell phone charger, television, computer, etc. all on that one circuit, and with only a couple hundred watts to spare, it’s easy to see how the circuit can get overloaded quickly. This creates a fire hazard and your circuit breaker or fuse will blow after a short period of time with the heating device on. To help avoid a circuit blow, run the portable heater on a lower speed or power rating. Also remember that one of these small heaters won’t be able to heat your whole house. You can try to section off the area you are trying to heat, or if it’s a bedroom close the door. If you’re trying to heat the family room, perhaps there is a hallway you can block off with some drapes so the heat doesn’t escape. Are windows, electrical outlets and switches leaking cold outside air into the home? Can they be sealed? They have special light switch and power outlet covers for less then a $1.00 at the store, if you need them. The final consideration when choosing a portable electric heater is how much it will cost you to operate. Of course, electric is almost always going to cost more to operate than any of the gas models mentioned at the beginning of this article. First, figure out how much power your electric heater is using a day. Multiply the watts the heater is using, (most are 1,500 watts) by how many hours the heater is turned on in one day. Let’s use 1 hour in this example. The result is 1,500. Then divide that number by 1,000. We get 1,500. The answer is 1.5 Kilo Watt Hours of consumption. (kWh). Next, you need to know how much the electric heater will cost you to use every day. Most power companies bill residential customers according to how many Kilo Watt Hours (kWh) of power are used. PG&E here in Valley Springs, CA, where I assume most of us get our power, has a tiered rate plan based on how much power you use per hour. As you use more power your rates go up to a higher rate. We already know how many Kilo Watt Hours (kWh) of power we used from the previous example, so we’ll use that. Let’s assume we are operating at the Tier 2 electric rate with a charge of $0.14 per Kilo Watt Hour, where most people probably are; especially if they are using electric heating. Take the total Kilo Watt Hours (kWh) the heater used for one day (1.5 in this example) and multiply it by the number on our PG&E rate tier ($0.14 in this case). This results in a cost of $0.21 cents to operate the heater for one hour a day. Now that we’ve got all that figure out, let’s discuss the difference between ceramic, infrared, oil, reflective, convection, fan, radiant, etc. How do you choose what heater to buy? From above, we know that most portable electric heaters put out the same amount of heat; they just do it a bit differently from each other. Most portable electrical space heaters, including oil filled radiators, baseboard heaters, fan forced, and ceramic heaters, are considered convection heaters. These typically have a fan. Convection heaters heat the air in the room as opposed to the radiant heaters, which heat objects. When you turn convection heaters off the room stays warm longer since the air is actually heated. Ceramic heaters are extremely safe. Electricity passes through ceramic plates, heating them up. The heat is then absorbed by aluminum baffles, and a fan blows the hot air into your room. The small ones typically handle 150 square feet, but larger ones are available. Some also oscillate to spread the heated air around the room faster. Great for bedrooms, small offices, the bathroom, etc. When you need the entire room heated, instead of one object like your body. These are most efficient in sealed rooms with no open doors or windows. Oil-filled space heaters perform like ceramic heaters in that they heat the air. They are ideal for use for heating a personal space or small room. The oil never needs to be replaced or maintained. They are silent because they have no fan, and typically run a bit cooler on the surface as compared to the ceramic heaters, so may be a bit safer around pets. A downside is the oil takes a short while to heat up once it’s turned on, but the upside to that is when you turn it off the oil will stay warm for quite a while. Infrared rays heat objects directly, making them the quickest to get warm. These are great anywhere you need fast spot heating. As soon as you turn them on you will start feeling warmth. These are mainly personal heaters because they heat objects (you), not the air. In a way this makes them more energy efficient because you can typically use a lower heat setting. Typical uses are workshops, garages, basements, or hanging outside with your buddies drinking a cold one. Infrared heaters typically don’t have fans, which usually makes them very quiet. Keep in mind that these heaters must hit something solid to create warmth since they do not heat the air, and the downside is as soon as you turn them off, the area cools very quickly. Another good example of using one of these would be if you like to have a cup of coffee on your porch at 5 am in the winter. Bring it out and you’re instantly warm. I hope this clears things up a bit and I didn’t utterly confuse you even more with all the numbers and what not. If you have questions or comments, please leave them below! This entry was posted on Monday, December 12th, 2011 at 5:34 PM	and is filed under Misc.. Both comments and pings are currently closed. Very good points on your article especially about security. A friend of mine had an electric space heater that caught fire. Personally I would use a space heater only in some occasions and not as permanent heating solution.